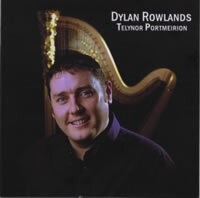 Wonderful mixture of Traditional Welsh Music and other well known tunes from his extensive repertoire of self arrangements used during his years as Official Harpist at Portmeirion. Dylan was born in Llan Ffestiniog. He was taught to play the harp by Gwenllian Dwyryd, then went to the Royal College of Music and Drama in Cardiff and received further lessons from Ann Griffiths. He is a peripatetic teacher and teaches in Primary and Secondary schools all over Gwynedd. As well as being a teacher he is a freelance harpist and is the Official Harpist at Portmerion, where he entertains the visitors at this romantic village. Dylan plays a Lyon & healy harp, (Style 23, Gold). MAM A DAD - AM EU CEFNOGAETH A MAGWRAETH CARIADUS. ELUNED - AM FOD YN FFRIND GORAU AC AM EI HELP CYSON. HYWEL A CATRIN - AM EU HANOGAETH A'U CROESO CYNNES YN EU TY A’R STIWDIO. MEIC A CORINA - AM EU CEFNOGAETH ERS Y CYCHWYN. GWENLLIAN AC ANN - AM FY NYSGU A RHANNU EU DAWN. NIGEL AC EURON - AM Y LLYNIAU FFANTASTIG BOB AMSER. Dylan Wyn Rowlands comes from a farming family in the Vale of Ffestiniog. He studied the harp with Ann Griffiths for three years at the Royal Welsh College of Music and Drama in Cardiff. He now teaches the harp for the William Mathias School Services in Gwynedd & Anglesey. Being the Residential Harpist of the Portmerion Hotel where he entertains the guests four times a week, he plays at weddings & functions and also appears in concerts. One of his recent tours was to Ireland with the Meibion Prysor Male Voice Choir. He is an established accompanist in the Urdd National Eisteddfod and the Cerdd Dant Festival. Having played at the Millennium Stadium among a hundred harpists, he enjoys success with his own pupil’s harp ensembles which have won many competitions throughout Wales.